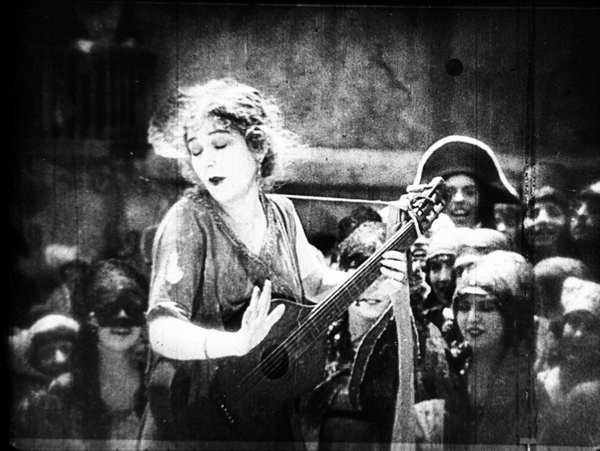 Few of Ernst Lubitsch’s and Mary Pickford’s silent films are as little known to modern viewers as Rosita (1923). It survived only in an incomplete print in the Soviet film archive, and a few other archives had copies of that print. Specialist researchers could see it, as I did while working on Herr Lubitsch Goes to Hollywood. (You can get a downloadable copy here.) Now the Museum of Modern Art has made a 4K restoration that played here at the Venice International Film Festival as a special screening on the night before the festival opening. Curator Dave Kehr introduced the film. Rosita has gained an unwarranted reputation as an inferior Lubitsch film. In Kevin Brownlow’s interview with Mary Pickford published in The Parade’s Gone By, Pickford claims that she was not happy with Rosita and parted ways with Lubitsch as a result. As I detail in Herr Lubitsch, however, correspondence between Pickford and Lubitsch reveals that a few years after Rosita, Pickford was still on cordial terms with him and asked for help on the editing of Sparrows. Why she made such a story up is anybody’s guess, but no one should see it for the first time believing that Pickford’s negative opinion, expressed late in her life, was her view of the film in the 1920s. Rosita was Lutbitsch’s first American film, though as I show in my book, he had learned American style while still working in Berlin and that it shows in his last two German films, Das Weib des Pharao (1922) and Die Flamme (1923). Rosita is a neat blend of Lubitsch’s two favorite genres during his German period, comedy and historical epic. The plot has Pickford as the title character, a Spanish street singer and dancer (see top) who catches the eye of a philandering king. Despite the actress’ reputation as a sweet young thing with sausage curls, she was quite versatile. Here she plays a street-wise, confident young woman clever enough to hold off the king’s advances while tricking him into lavishing her and her family with clothes and a villa. There’s also a handsome soldier; Rosita falls in love with him and must save from the gallows. His plight furnishes the more serious and suspenseful side of the plot. Lubitsch uses the big sets and crowds that he had become famous for with films like Madame Dubarry (1919) and Anna Boleyn (1921). Working with a Hollywood budget, he created some huge vistas, including a street scene near the beginning where carnival revelers are seen from the foreground to the very distant background (with a glass shot providing the towers; see bottom). The endlessly tall prison wall is another impressive setting. The print we have seen up to now was not in good shape visually, being quite contrasty with blown-out highlights. The MOMA has done an impressive job of restoration, improving the visual quality distinctly. The intertitles in the surviving print, being in Russian, had to be replaced by using many sources. 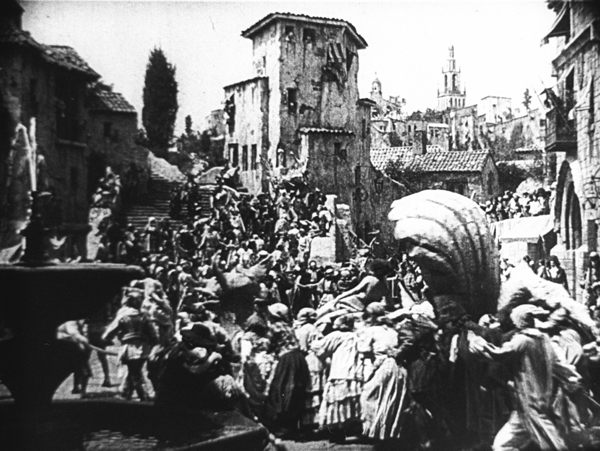 One reel preserved by Pickford herself provided the visual design template (still photos of scenes used as backgrounds for art titles). The texts were translated from Russian, gleaned from Swedish and German censorhip lists, an early draft of the screenplay held by the Academy of Motion Picture Arts and Sciences, a few lines quoted in reviews of the time, and a music cue sheet preserved at George Eastman House. 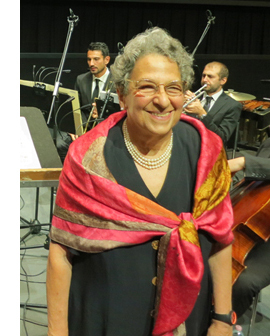 The result works beautifully with the film, as Anderson demonstrated when she conducted the Mitteleuropa Orchestra to accompany the presentation (right). Rosita may not be among Lubitsch’s greatest films, but it is charming both in itself and as a display of Pickford’s talents. He would go on to discover the genres that made him one of Hollywood’s top directors. In place of the delightfully broad comedy of his German comedies like Ich möchte kein Mann sein (1918) and Die Puppe (1919) he discovered the sophisticated romantic comedy in such masterpieces as The Marriage Circle (1925) and Lady Windermere’s Fan (1926). It would serve him well in the sound era with Trouble in Paradise (1932), The Shop around the Corner (1940), and others. Earlier, as sound came in, he turned out a variant of the genre in a brief series of romantic musical comedies (e.g., The Love Parade, 1929; The Smiling Lieutenant, 1931). The applause after the screening of Rosita was enthusiastic and prolonged. 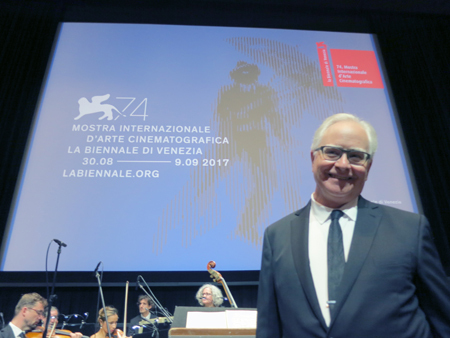 The restoration should receive wide circulation at festivals and archival series, as well as on Blu-ray–presumably with this score included. Our Rosita images come from a print derived from the Russian version. The MoMA restoration is far more crisp and clear. Thanks for Gillian for correcting our original brief description of her work on reconstructing the score and for providing a more detailed account of how she did it! This entry was posted on Friday | September 1, 2017 at 1:20 am	and is filed under Directors: Lubitsch, Festivals: Venice, Silent film. Responses are currently closed, but you can trackback from your own site.